Nearly one year after South Sudan achieved independence, creating the world’s youngest nation, conflicts and disputes engulfing Sudan and South Sudan have created new humanitarian crises and contributed to high global oil prices. So said U.S. officials and American lawmakers on Capitol Hill Wednesday. No one predicted that South Sudan’s independence from Khartoum would end the bloodletting and suffering that has plagued the region for decades, and, in fact, no such happy outcome has materialized. At a Senate Foreign Relations Committee hearing, U.S. officials detailed conflicts between the Sudanese government and rebels that have spawned a new refugee crisis spilling over into South Sudan. “The continuing violence in South Kordofan and Blue Nile [states] is adding to the tensions between the two countries, to border conflicts. Since last June, this conflict has created an enormous humanitarian emergency as well as a serious political problem for Sudan,” said US Special Envoy to Sudan and South Sudan, Princeton Lyman. Nancy Lindborg of the U.S. Agency for International Development said initial euphoria over South Sudan’s independence has given way to grim realities. “Inside South Kordofan, there are 300,000 displaced and severely affected [people], and another 60,000 inside Blue Nile. We have seen heavy aerial bombardment, long-range shelling that has terrorized communities. It has cut off people’s access to food. International humanitarian access has been largely blocked since the beginning of this conflict, and the government of Sudan continues to prevent aid from reaching the many civilian Sudanese who are desperately in need,” Lindborg said. Lindborg’s words were illustrated by a star testifier at the hearing: American actor and activist George Clooney, who recently returned from a trip to Sudan. “Three days ago, while we were in the Nuba mountains [in South Kordofan], 15 bombs were dropped on a neighboring village. When we got there, we found children filled with shrapnel, including a nine year-old boy who had both of his hands blown off. And as we met with their leaders, we were also met with three 300-milimeter rockets fired overhead. We witnessed hundreds of people running to hills to hide in caves for their safety. 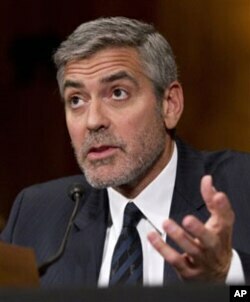 And that happens every day,” Clooney said. Special Envoy Lyman encouraged political reform in Sudan as well as continued engagement by the international community to pressure Khartoum to allow humanitarian relief into conflict zones, and to help resolve festering territorial and petroleum disputes between Sudan and South Sudan. The committee’s chairman, Democratic Senator John Kerry, agreed. “It is the leaders in Khartoum and Juba who must choose between a future of conflict and poverty, or a future of security and prosperity. But we must not abdicate the important role the United States can play in helping to nurture the process - just as we helped to midwife the birth of a new nation,” Kerry said. The top Republican on the committee, Senator Richard Lugar, noted that the standoff between Sudan and South Sudan over oil production and transportation has contributed to rising gasoline prices paid by American motorists. “Even though the United States imported no oil from Sudan, oil is traded on a world market. So, in today’s tight oil market, any major loss of supply affects all prices,” Lugar said. On a positive note, Special Envoy Lyman hailed continued and possibly rejuvenated efforts to peaceably resolve disputes between Sudan and South Sudan. Talks are being held in Ethiopia with African Union mediation.